Ready in only an hour, our spiked shooters use fresh apples and butternut schnapps to bring you the delicious taste of autumn (with a little added kick). 1 Heat oven to 375ºF. Spray bottom only of 8-inch square pan with cooking spray. 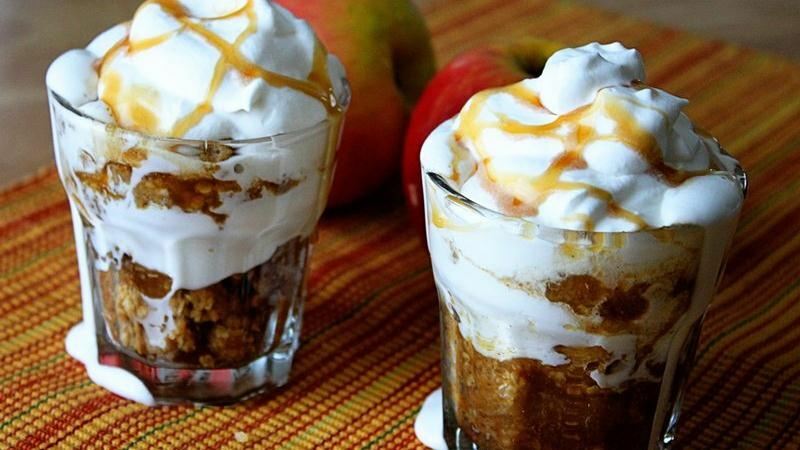 In large bowl, toss apples, granulated sugar, brown sugar, cinnamon and 1/2 cup schnapps. Spread in pan. 2 In medium bowl, mix melted butter and cookie mix. Spread on top of apples. 4 Meanwhile, in chilled medium bowl, beat whipping cream, 1 tablespoon schnapps and the powdered sugar with electric mixer on medium-high speed until stiff peaks form. 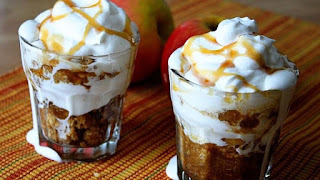 5 To serve, alternately spoon warm apple crisp and cream mixture into small glasses. Top each with caramel topping. Serve immediately.